Sewanee got pounded with rain yesterday. A hard day for birds that feed on aerial insects. 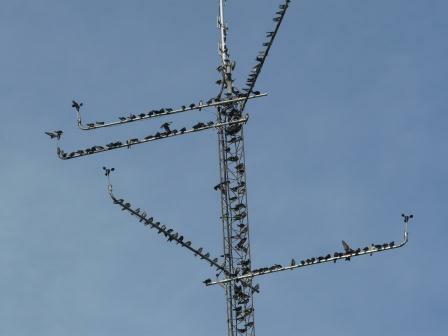 Late in the afternoon, the skies cleared and dozens of purple martins swarmed the radio antenna pole near Lake Cheston. They circled in noisy groups, feeding then swirling in to roost. Many of these birds are likely migrants from the north, winging their way across Tennessee on the first leg of a long journey to their Amazonian wintering grounds. In the eastern U. S., martins are almost entirely dependent on humans for nest cavities, a dependence that goes back to the days of Native American agriculturalists who erected poles with hollow gourds for the birds. Martins chase away crows, so this was a mutualistic arrangement. The birds got homes; the humans got protection for their corn crop. I think Lake Cheston could use a handsome box. Perhaps a class project for the spring? This entry was posted in Archosaurs on August 10, 2012 by David George Haskell. An excellent class project, I think. We went to a purple martin seminar once as we were interested in attracting them to our house. It’s a fairly complex process. They don’t just show up to a box or group of gourds strung willy-nilly on a pole. Siting them right is essential. And someone, an early-riser preferably, will have to play a recorded dawn song at, yes, dawn, to attract the first colonizers. Some enthusiasts employ decoy houses to fake out the common starlings that inevitably take over. We were also told that one had to be prepared to, um, euthanize any starling, adult or otherwise, found nesting in the box/gourd. And someone has to keep the boxes clean and pest-free. But a project would be a great way to start record-keeping and observation of this marvelous species. Starlings will definitely be an issue at Lake Cheston. A box/gourds that can be raised and lowered will help in the initial stages, I hope. I’ve also thought about installing the “artificial chimneys” that can be used for swifts. They currently use the chimney on the old dairy building at Cheston. Glad to hear that you’ve been having some luck with swifts. Fascinating birds. How Interesting! At our home is an ugly armature for a massive old dish antenna we removed when we moved in. It’s too solid to easily remove and it just sits there waiting inspiration — I was just thinking of attaching some TV antennae, those roof-top kind with a lot of — cross members? — to make an artificial tree for birds to perch, near the bird bath. We get a lot of hummingbirds, purple finches, gold and white crowned sparrows and etc – chaparral birds. Seeing those martins on the wireless antenna encourages me! Sounds like a great opportunity for an art installation! How neat! Loved learning about these birds. In my opinion, there can never be enough Martins in the world ;) . Yes, Martins of *all* sorts are fabulous. Let me know how the Amazon is this winter…! We have a running family joke that we are going to name one if our kids “purple”. Wish we were headed to the Amazon thus winter but sadly don’t have the means yet…one day! Til then, we will be year round residents.